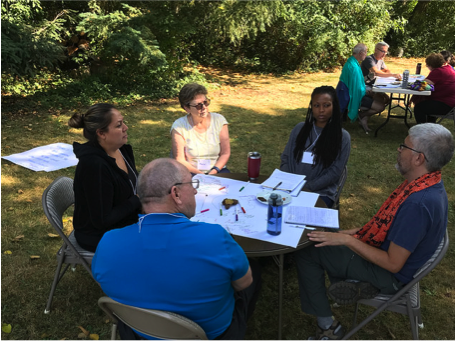 Thank you to Jim Strader-Sasser, an Episcopal priest and recent participant at The Circle Way Practicum held August 2018 on Whidbey Island, for sharing his reflection on his practicum experience. There were 24 of us together, from varied backgrounds. As Jim describes, we were in a full field of learning and practice. I attended The Circle Way Practicum on Whidbey Island WA from Aug. 15 - Aug. 20, 2018 on Whidbey Island, WA. The learning group was comprised of 22 practitioners and 2 highly skilled hosts, Amanda Fenton and Tenneson Woolf. The group was very diverse. Attendees traveled to this circle from a vast array of cultural, generational, professional, and geographical contexts and disciplines. I was amazed at the quality of each participant’s authenticity and competencies – as people and as community members. The event happened at Aldermarsh - a beautiful sustainable environmental retreat center. Whidbey Island is a paradoxical setting. The island is home to a military naval air station on its northern shore as well as to natural sanctuaries such as Earth Sanctuary, Whidbey Institute, and Aldermarsh on southern shores. It is in this puzzlingly holy space (fields to use Rumi’s terms) where The Circle Way gathers and flourishes, despite and because of such contradictions. A typical day began, for me at 5:30 in the morning for mediation and preparation. Attendees communed for breakfast at 8am. The Circle met for morning, afternoon, and evening sessions, with some time off for reflection and relaxation on one evening and one afternoon. Formal sessions usually ended before 9 pm. The exception to this rule was an especially emotional and bonding “Story Council” on Saturday evening. Small groups often gathered for reflective and refreshing conversations after the evening session. I was normally asleep by 11:00 pm. My initial purpose was to learn more about The Circle Way for its tools and techniques. How might I incorporate them and use them in my ministerial and consultative practices? However, what I have crossed the threshold with is something much, much greater. I have gained a cohort (circle) of beloved peers and friends. And, I now possess a much deeper insight about what types of questions, reflections, and conversations hold holy capacity for creating true communities. The Circle Way creates immense capacity for motivating transformation in communities such as mine, Christ Memorial Episcopal Church and the Diocese of Central Pennsylvania. It is here where my transformational Circle Way work will be born. 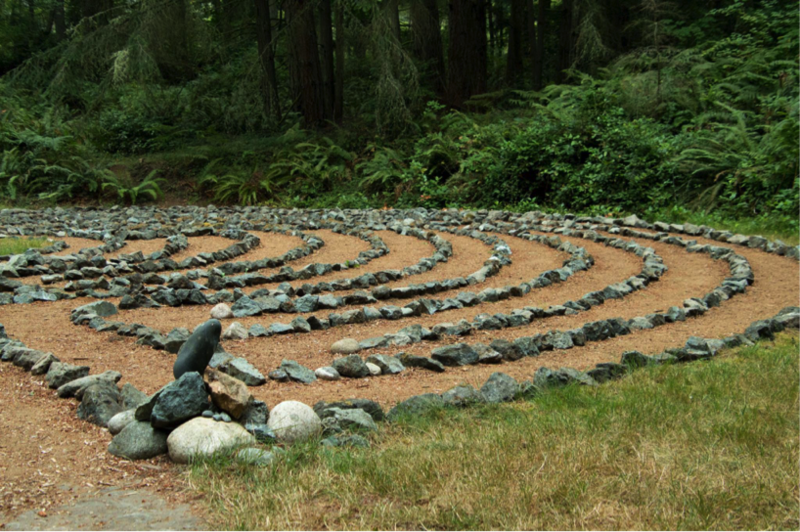 The birthing point of The Circle Way practice values a foundational fact that human beings have gathered in circles for hundreds of centuries. Beyond this reality, the circle is one archetype for understanding basic human motivations as well as our shared collective unconscious. (Neill, 2018) We have gathered this way for millennium. We should gather around shared fires again. Today, we live in contexts when and where most people and organizations have lost their understanding of communicating in circles. Instead, especially when under stress or contending with confusion, we choose to debate/argue/deliberate with one another in dyads, triangles, or squares. These conversational choices frequently lack shared purpose, consensus toward addressing and acting upon a common need, and shared desire to maintain healthy relationships with one’s self and one’s neighbors – friendly or otherwise. I appreciate that The Circle Way process invokes some of my faith tradition’s core tenets. What we share at the center of our conversations yokes us into deeper communion. The center of such offerings is an altar of sorts. What we share of ourselves there is sacred, vulnerable. It is on such circles with a shared grounding where God invites us into deeper covenant with God and one another. Spiritual synergy happens in such space, provoking shared purpose and flourishing. 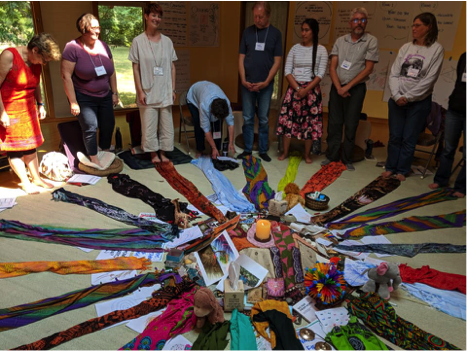 The Circle Way Practicum was without a doubt one of the most transformational experiences of my life as an Episcopal priest I invite prayers, ideas and participation as to where we may begin and continue this transformative work. I hope that your Circle Way experiences provide your renewed purpose for your pilgrimages.